Filter Holdings fabricates standard and customized product collection bags, transfer sleeves and air relief bags for a variety of product processing applications including fluid bed drying, milling, and pulverizing process equipment. With a wide range of quality woven and felt fabrics and specialized surface treatments available, our filter media can meet a broad spectrum of airflow, product collection and product retention requirements. Milling, pulverizing and fluid bed drying operations require filter bags for collecting powdered materials and, when applicable, containing dust in an air relief bag. Filter Holdings makes standard and custom bags to precisely fit any type of product processing equipment including fluidized dryer beds, and milling or pulverizing equipment. An essential item in directing product flow between processing equipment, transfer sleeves ensure materials transfer with no loss or spillage. Filter Holdings can custom fabricate transfer sleeves to your unique specifications. Filter Holdings product collection bags, air relief bags and transfer sleeves are laser cut with dimensions and features digitally stored for accurate reproduction on future orders. With nearly limitless options for customization, Filter Holdings is your best source for industrial filtration product collection bags and transfer sleeves. 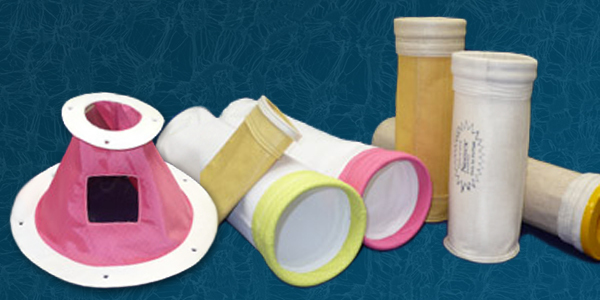 Filter Holdings offers a complete line of superior quality filtration products for collecting or transferring fine powders and dusts, with seams lock stitched for strength and optionally seam-sealed to prevent leakage. We offer specialized filter media options including Unipore, our expanded PTFE surface treatment for the ultimate performance in surface release, fine dust retention, and product loss prevention. Only available through Filter Holdings, Unipore solves unique filtration challenges, including filtration of static sensitive or chemically reactive dust streams.